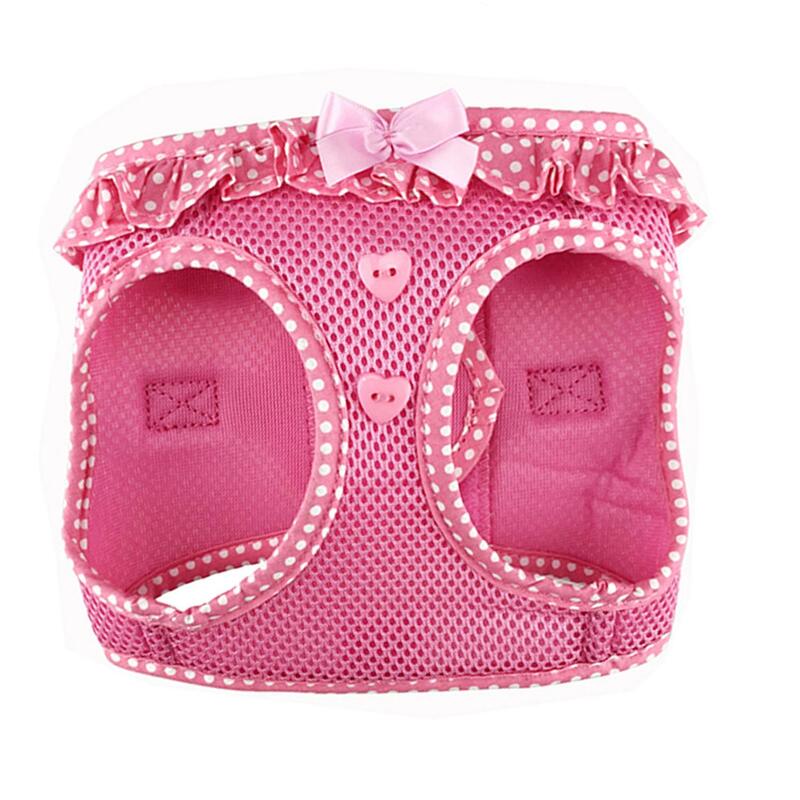 Head out for a walk in safety and fashion with the American River Choke-Free Dog Harness in Pink Polka Dot by Doggie Design! The ever-popular American River Choke-Free dog harness has been given a fashion update with the same safety features you love! Our new American River Polka Dot harness collection is designed with the small dogs in mind. This line of harnesses ranges from an X-Small to an X-Large and feature a frill around the neck and a fun color matching polka dot trim! Decorative heart buttons and a pink bow completes the look. Athletic mesh fabric keeps your pup cool and comfortable. 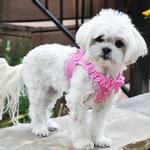 This step-in harness goes on easily and secures with touch fastener, a quick-snap buckle, and double D-rings. Machine washable. Available in Pink, Purple, and Teal, each sold separately. I bought this with the matching leash for my daughter's lovely new dog she rescued from a shelter three weeks ago. It looks lovely on her and it fits perfectly. Her poor little bichon-poodle mix dog has not had an easy life and she is now 8 years old so I'm glad we get to spoil her with fabulous outfits from Baxter Boo. Posted On 07/13/18 by Marilyn C from Salem, OR Yes, Marilyn C recommends this product! I bought this for our new little family member, Lola. Once she grows and is able to wear it, she'll prance around with my Bella Rose and show herself off as Bella Rose will be wearing hers in order to show off her femininity to the world who presently know her. I so adore my "ladies" and their new harnesses. Thank you. Posted On 06/06/18 by Lisa G from Lubbock, TX Yes, Lisa G recommends this product! I bought the size medium for my 12 1/2 pound Poodle/Chi mix and it fits perfectly. 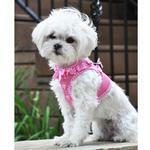 She isn't very feminine so I always try to put her in harnesses that show she is a girl and this one is very girly! The velcro is substantial and secure. Love the company. Easy to shop from. Wish items would come more quickly. Thank you!